What is up lately with me and books that almost made it to the DNF pile, only to be yanked back at the last second, when a scene all of a sudden grabs me by the throat and forces me to keep reading?Yes, I completely meant that. Certain books are pulling a master/slave act on me, telling me that I will like them...or else. I can feel the books almost glaring at me, daring me to push them, else I feel their punishing wrath.WHY BOOKS, WHY?!? I want my reading experiences to be black and white - either I like you from page 1 or I quit out. Don't pull this confusing wtf-ery on me. Please.This is another one of those times when I feel like the things that I really want to say are things that I can't. Because if I tried, then I'd have to spoiler tag the entire review and I really hate doing this. So what can I say? Uh, there was a moment which reminded me of a scene from The Sound of Music. Yes, I can pull comparisons from just about anywhere. (very) Mini spoiler ahead - quick, jump to the next paragraph if you are afraid! Without giving away who the traitor was, I had a brief flashback when Mr./Ms. X turned on a member of Saba's crew, just like the little squealing nazi-in-training did to the Von Trapps when they were hiding in the abbey. Btw, did you know that the famous hiding scene from that movie was inspired by a cemetery? I just found this out now. Random, but I really want to go to Austria on a Sound of Music lovers tour. Does such a thing exist? What else? If you're looking for lots and lots of Jack time, sorry. Oh, he's there. And he's awesome, of course. But I felt like a fangirl standing outside of Michael Jackson's balcony back when he was still alive, hoping to catch a glimpse of some baby-dangling. 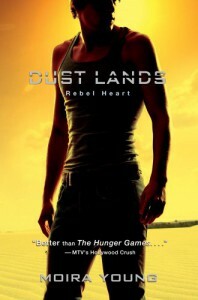 By the time I finished the book, I'd felt like I'd been camping out for days, unwashed and grumpy - and the baby dangling was not worth the reward.If you were a big fan of book 1, then Rebel Heart is probably worth the read. Even though it took me a while to warm up to the plot, eventually I did get there. If you were on the fence about book 1, I'd say go ahead and skip this because any struggling that you might have had with the first book will be echoed in the second.